Richie was a 15-year-old boy referred for evaluation after multiple run-ins with the police for drug possession, fighting, and shoplifting. Richie was the oldest of three boys and looked up to a gang-involved cousin who was in prison for drug trafficking. The patient was enrolled in multisystemic therapy (MST) for both treatment and further evaluation. Richie’s MST therapist met with his family 3 to 4 times per week over the first three months of treatment. The therapist encouraged the family to increase their level of supervision over their boys, prevent Richie from smoking marijuana at home, and limit his access to problematic peers. Over the course of treatment, Richie’s parents established regular communication with teachers and helped him get involved with a local boxing team after school. Richie’s therapist reduced the frequency of visits over the final two months of treatment. At the conclusion of treatment, Richie was meeting curfew consistently, completing school assignments, and no longer testing positive for marijuana. Richie’s younger siblings also began doing their school work more consistently and behaving better on the playground. What is conduct disorder? Are there different types? And more importantly, how can we best treat these patients? This month’s Q & A with Dr. Marsh touches on these issues, and I recommend you read that interview first to give you a basic foundation. In this article, I’ll go through the topic in a more structured and systematic way, so that you can get a lay of this complicated land. ODD is defined by a pattern of angry, argumentative, irritable, defiant, and/or vindictive behavior for 6 months or greater. In order to meet full DSM-5 criteria for the disorder, a young person must display 4 or more cardinal symptoms that relate to mood, defiance, and retaliatory behavior (see the table “DSM-5 Criteria for Oppositional Defiant Disorder and Conduct Disorder” on page 4). In contrast to ODD, CD is identified on the basis of behaviors that often violate the rights of others and break social rules—as opposed to simply being defiant and angry. In order to meet DSM-5 criteria for conduct disorder, a person must meet 3 of 15 diagnostic criteria spanning four separate domains (see the table on page 4). DSM-5 further divides conduct disorder into two subtypes based on age of onset (ie, before or after 10 years of age). Youth who develop conduct disorder prior to age 10 tend to have a less favorable long-term prognosis. Finally, DSM-5 also includes a “with limited prosocial emotions” specifier for youth with CD who have 2 or more of the following traits: lack of remorse or guilt, callousness or lack of empathy, absence of concerns about performance, and a shallow or deficient affect. Like early age of onset, this specifier implies a poorer prognosis. The limited prosocial emotions specifier is often more colloquially termed psychopathic traits, and these are not unique to CD. Psychopathic traits also occur in ODD and, as in CD, are correlated with worse treatment outcomes. According to the Centers for Disease Control, around 3.5% of youth between the ages of 3 and 17 years have a behavioral problem such as ODD or CD at any given time. Disruptive behavior disorders are more common in boys than girls by a margin of roughly 2:1 (Perou R et al, MMWR Surveill Summ 2013;62(Suppl 2), 1–35). About 40% of youth with ODD go on to develop CD (Loeber R et al, J Am Acad Child Adolesc Psychiatry 2000;39(12):1468–1484). CD and ODD rarely occur as isolated conditions. Most kids with either diagnosis have at least one other psychiatric disorder, the most common being learning disorders, depression, bipolar disorder, anxiety disorders, substance use disorders, and attention-deficit/hyperactivity disorder (ADHD) (Maughan B et al, J Child Psychol Psychiatry 2004;45(3):609–621). The combination of ADHD and CD is especially troublesome, since it’s associated with substance use disorders and persistent antisocial behavior in adulthood. By the way, adults can also have either CD or ODD—with the provision that those who meet criteria for antisocial personality disorder can’t also have CD. While not incorporated into DSM-5, recent research has found that there are two types of aggression: hot vs. cold. Understanding this distinction will help you in your treatment of patients with CD. Hot aggression has a defined trigger and is essentially losing one’s temper. It is also referred to in the literature with the mnemonic RADI: Reactive, Affective, Defensive, and Impulsive. A good example from popular culture of hot aggression is the Incredible Hulk. Bruce Banner is a mild-mannered scientist who morphs into “the Hulk” whenever he is threatened or becomes angry. The Hulk’s rage is nearly impossible to control. Cold aggression, by contrast, is more similar to what many people think of as psychopathic aggression. A common mnemonic for it is PIP: Planned, Instrumental, and Predatory. An extreme portrayal of cold aggression is Dr. Hannibal Lecter from the book and movie Silence of the Lambs. Dr. Lecter coldly calculates and plans violence of all sorts to satisfy his desires, and he is devoid of empathy and remorse. Youth with a propensity for cold aggression often have reduced biologic reactivity to dangerous and stressful situations. They also tend to be less biologically responsive when observing fearful facial expressions in others and are relatively undeterred by punishment. Cold aggression identifies youth who qualify for DSM-5’s specifier, “limited prosocial emotions.” Other terms often used for these kids include “callous-unemotional” or “psychopathic” personality traits. 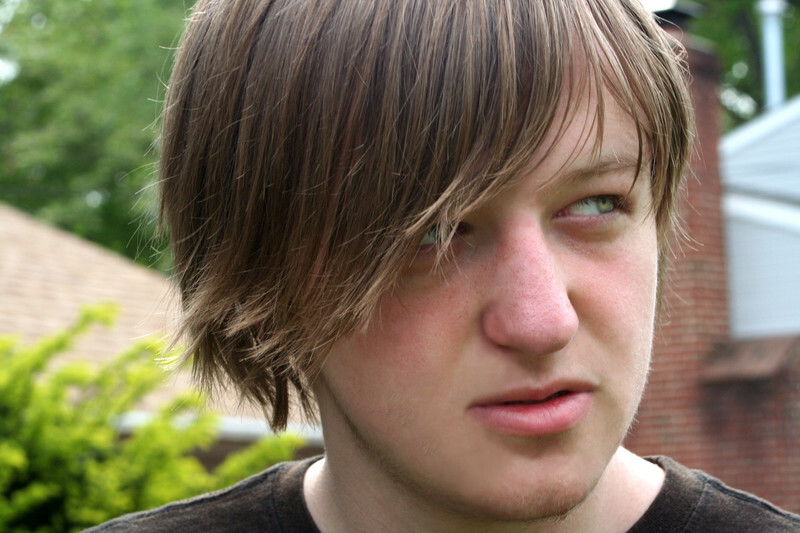 Youth with CD often display mixtures of hot and cold aggression. Understanding a patient’s aggression profile is important in terms of your treatment decisions. Youth with CD and hot aggression are more responsive to therapy and medications (Steiner H et al, Child Adolesc Psychiatry Mental Health 2011;5:21). Those with cold aggression usually need structured, longer-term, intensive services—a type of care that generally is hard to find. While causes of CD of ODD are far from established, there are certain well-known risk factors. These include those you would suspect—poverty, growing up in dangerous neighborhoods with increased risk of exposure to trauma and abuse, inconsistent parenting practices, lack of appropriate supervision, parental incarceration, and associating with delinquent peers. For both CD and ODD, evidence suggests that temperamental factors such as poor emotional regulation during infancy and early childhood are key, especially with inconsistent or ineffective parenting with ODD and harsh, punitive parenting with CD (Manglio R, Trauma Violence Abuse 2015;16(3):241–257). The main treatments available for CD and ODD involve psychosocial interventions and, in some cases, medication for symptom relief. 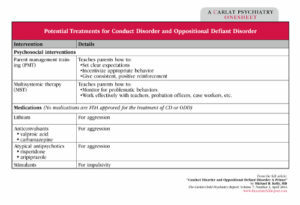 We’ve put together a table, “Potential Treatments for Conduct Disorder and Oppositional Defiant Disorder,” below outlining these interventions. Parent management training (PMT) aims to empower parents to retake the reins within the family system, set clear expectations, and incentivize appropriate behavior, all while providing healthy doses of positive reinforcement. In PMT, parents are initially tasked with observing their children’s behavior closely so they can create explicit goals and then monitor progress. Parents learn to incentivize positive behaviors through social reinforcers (eg, praise, hugs) and tokens (eg, gold stars, points) that can be exchanged for special activities (such as going out for ice cream or to a baseball game). Parents learn to provide discipline promptly, calmly, and consistently in this approach. PMT has been shown to be quite effective for ODD and ADHD and somewhat effective for CD. This approach works best with school-aged children, although it has been used effectively in conjunction with individual approaches in teens. Multisystemic therapy (MST) is an approach designed for a subset of conduct-disordered youth who are entrenched in the juvenile justice system and often also have comorbid substance use problems. The technique targets environmental factors that perpetuate juvenile delinquency and substance abuse. MST therapists are on call 24 hours a day to help families stay on track. Over a typical four- to five-month treatment course, MST teaches parents how to better monitor their kids for problematic behaviors. MST therapists also help parents work effectively with teachers, probation officers, case workers, etc. to ensure that the benefits of MST continue after treatment is terminated. MST has been shown to reduce recidivism and substance abuse and also appears to reduce the likelihood of conduct problems in the siblings of MST clients (Wagner DV et al, J Consult Clin Psychol 2014;82(3):492–499). Click here to view table as full-sized PDF. There are no FDA-approved medications for the treatment of CD or ODD. However, there’s some evidence for the effectiveness of valproic acid, especially for curbing hot aggression (Padhy R et al, Child Psychiatry Hum Dev 2011;42(5):584–593). Atypical antipsychotic medications are also effective in reducing hot aggression when used judiciously, while stimulants can improve both CD and ODD when they are comorbid with ADHD (Connor DF and Doerfler LA, J Atten Disord 2008;12(2):126–134). There are no hard-and-fast dosing guidelines for treating hot aggression. In general, medications should only be used when behavioral interventions aren’t enough. As always in child and adolescent psychiatry, we recommend that you “start low and go slow” when initiating meds on kids, especially those prone to hot aggression. However, medications don’t seem to touch kids with cold aggression. In sum, CD and ODD are serious, often chronic disorders that can produce major problems for the individual, family, and society more broadly. Too often, individuals with these diagnoses are dismissed as “bad apples” and may well end up in the legal system, where effective treatment is unlikely to be available. Accurate diagnosis and intervention, especially of ODD and some subtypes of CD, can be life-changing.